Home » Aqua Master Online » All Things ePostal! 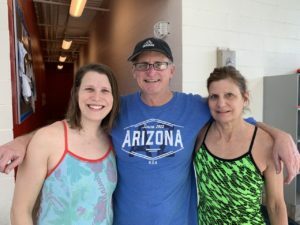 I know the next ePostal swim event does not begin until May 15, but there are some things that new swimmers need to know about doing an ePostal swim. We want you to be both mentally and physically prepared to participate. There are about 1000 members in OMS and many have never swum an ePostal event. Bob Bruce, our OMS Long Distance Chairman, wants Oregon to be first in the nation in all the ePostals. Bob is the reason that Oregon is a leader in the ePostal events. “I recommend the One-Hour swim in January-February or the 3000 yard (or 6000 yard) swim in the fall as the most accessible swims for a typical team. And, of course, I love the tie-in with the larger Oregon Club—leader in all things ePostal! “Each ePostal swim must be done separately, that is, the 3000 split on the way to a 6000 swim doesn’t count as two swims. I recommend doing ePostals in yards (meaning more turns, thus faster times or greater distance), except for the summer ePostals that must be done in long course meters. Arlene Delmage writes: “Ninety-two OREG swimmers entered the One Hour ePostal swim for 2019, what a great showing! It seems that many members may be taking advantage of the very generous offer from an OMS Board member, which is to pay the 2020 USMS and Oregon Club membership dues (a $64 value) for any swimmer that completes 3 or more ePostal National Championships swims in 2019. When you swim an ePostal there are several things that you must do. Locate a pool that is the correct distance for the ePostal you are swimming. OMS rents a 50-meter pool for use by their membership for the 5km and 10km swims. This year OMS will rent the Amazon Pool in Eugene, Oregon, on Saturday, May 25th from 2pm-6pm. Find someone who is willing to record cumulative times by lap for you. Then, after you swim, you must register for your swim to count.